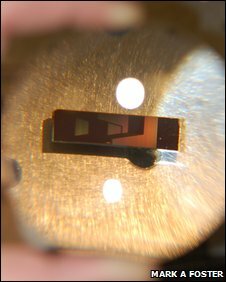 A magnified image of a 1-cm silicon waveguide, part of a "time telescope"
Researchers have demonstrated a "time telescope" that could squeeze much more information into the data packets sent around the internet. Rather than focusing information-carrying light pulses in space, like a normal lens, it focuses them in time. The telescope comprises laser beams that combine in a tiny silicon structure to compress the pulses. A prototype device, described in Nature Photonics, boosted the data rate of telecoms-wavelength pulses by 27 times. A general rule in physics is that the shorter a pulse is in time, the higher its "bandwidth" - a measure of the spread of colours within it, and therefore of its information-carrying capacity. State-of-the-art devices used in telecommunications today generate pulses with a bandwidth of 10 GHz, using standard electronics to encode information onto those pulses directly. 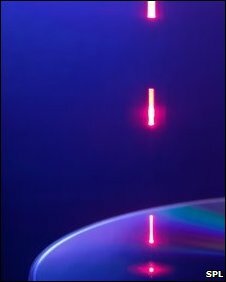 Purely optical systems can generate pulses with a bandwidth nearly 100,000 times higher. However, getting the information onto the pulses, or modulating them, has been beyond the reach of the electronics that are currently used. Light pulses are spread out in space; if an instantaneous snapshot could be taken of them, those that are longer in time would appear physically larger. The trick to the new work is to use "temporal lenses" that can squash comparatively long pulses in time by selectively speeding up or slowing down their different parts. The idea uses silicon waveguides as the lenses. A long, 10-GHz pulse containing bits of data and a much shorter laser pulse with no information pass through one of these waveguides. A race is then set up between the halves of the pulse, with the back speeding up and the front slowing down as it passes through an optical fibre. That is due to complex interactions with the silicon, forcing the data-rich pulse to take on the temporal properties of the shorter pulse. Just like an optical telescope, combining two of these temporal lenses creates a time telescope that can take a standard 10 GHz pulse and create an "image" of it. That jams the same information into a pulse just one twenty-seventh as long. "The primary limitation of this approach right now is the length of the packet that can be compressed," said Cornell University's Mark Foster, lead author of the research. "Typical packets used in internet communications are much longer than 24 bits, therefore extending the time window over which compression occurs is the primary problem to be solved in future generations of this device," he told BBC News. Reading out the data on a light pulse is limited by the same electronics that generate them in current systems, so a "decompressing" scheme would need to be implemented on the receiving end. However, Dr Foster said that the system, while complex, is very robust and needs relatively little power, making it potentially attractive for industrial use. Moreover, he said, it could be applied to the fields of chemistry and biology, which can probe the most minute and fastest processes in nature - such as protein folding or chemical reactions - if only given structured pulses of sufficiently short duration. The new method could vastly improve the ultimate time limit of these studies. While significant work would need to be done before the world's data rates see the benefit of the new approach, Dr Foster is still impressed with how it initially came together. "The most surprising thing for me was seeing it all work," he said. "You spend a lot of time designing and modelling the system and putting it all together and it is always surprising and exciting to see it work as well as you imagined it would."